Slim down If your dog is overweight, commit to helping her slim down. Extra weight places extra strain on joints, worsening the pain of arthritis. Feeling guilty because your dog is looking longingly at her food bowl? Mix a little pumpkin (unsweetened, not canned) into her dinner; it’s healthy, low cal, and will help her feel full. We like both Fruitables’ and Merrick’s natural canned pumpkin for dogs. Gentle exercise Your dog absolutely still needs regular exercise—it is a must—to keep her moving and from stiffening up, just make sure it’s controlled, gentle, low impact, and short in duration. Try a dog treadmill, which allows for a slow walk at your dog’s desired pace. Improved traction Arthritic dogs are less steady on their feet. Offer them stability with secure rugs for traction or a product like Dr. Buzby’s Toe Grips, which puts an end to slipping, sliding, and struggling, by providing instant traction for slipping senior, arthritic, or special needs pets. Made of a natural nonslip material, they grip the floor, keeping your dog steady and upright. Canine massage Massage eases sore muscles, lowers blood pressure, and reduces stress for both the giver and receiver. Plus, it’s a great for bonding and a wonderful way to check in with your older dog, enabling you to note any new lumps, bumps or sore places. Acupuncture Yes, acupuncture. It’s not just for people. Veterinary acupuncture stimulates the release of the body’s own pain-relieving and anti-inflammatory substances. Pain medication, including nonsteroidal anti-inflammatory drugs (commonly called NSAIDs), may help relieve pain, and disease-modifying osteoarthritis drugs (DMOADs) can also play an important role. 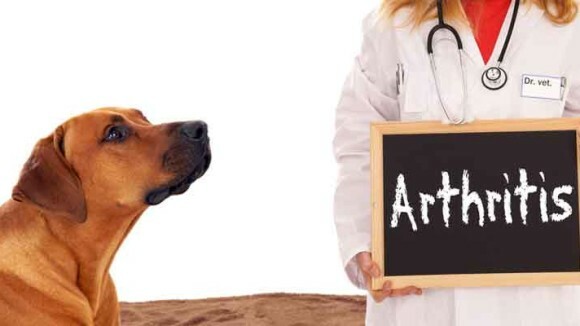 Talk to your veterinarian before giving your dog any medication. Glucosamine and chondroitin supplements can be used to help improve joint mobility and support better joint functioning for dogs with arthritis. Acupuncture isn’t just for people. This painless technique has shown some success in animals suffering from arthritis. If your dog’s arthritis is advanced, surgery may be an option. Ask your veterinarian about the pros and cons of surgery and what you can expect. Be sure to take steps to adjust his environment at home. Some things that can help an arthritic dog include: providing soft supportive bedding for his achy joints, using ramps to help a dog get in and out of a car or up to a bed, and putting down carpeting and secure rugs to help him get traction as he walks. Remember: A low-stress environment, plenty of affection, and supportive care can help your dog feel so much better.